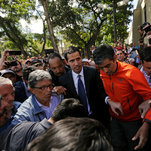 The rally in eastern Caracas, where at least 500 people converged in a square ringed by police officers, was peaceful and orderly, and there was no immediate indication that the opposition leader, Juan Guaidó, would be taken into custody, as many had feared. At the same time, President Nicolás Maduro, who had been furiously describing his adversary as the lackey of an American-backed coup, appeared to take more conciliatory approach, calling for dialogue. Alluding to clandestine meetings that had taken place between opposition members and people in Mr. Maduro’s orbit, he expressed a willingness to attend such meetings himself. “If I have to use a hood or go naked, however I have to go,” Mr. Maduro said at a news conference. It was not immediately clear why he seemed to be taking a softer tone. But Mr. Maduro’s call for dialogue appeared to signal that the balance of power in the standoff between the government and Mr. Guaidó may be shifting to the opposition leader’s side. Opposition lawmakers and analysts said he may sense that loyalty to him among the security forces may be slipping as support for Mr. Guaidó grows. Mr. Guaidó began his remarks at the rally by requesting a minute of silence for “victims of brutal repression,” referring to demonstrators who have been killed or wounded in violent protests that flared throughout the past week in Venezuela. “We have awakened from the nightmare, brothers and sisters,” said Mr. Guaidó, the 35-year-old leader of the National Assembly, the opposition-dominated legislature that has been rendered largely powerless by Mr. Maduro. Over the past few weeks, Mr. Guaidó has emerged as the most direct challenge yet to Mr. Maduro, whose longtime stewardship of Venezuela has plunged the country into a prolonged bout of repression and severe economic decline. Mr. Guaidó exhorted supporters to demonstrate peacefully and urged them to distribute copies of an amnesty law the assembly had passed that encourages members of the armed forces to switch their loyalty to his side. He also said his arrest was a real possibility. “If they dare to kidnap me, I ask you to continue on the path and move forward in a nonviolent manner,” he said. The rally was held two days after Mr. Guaidó declared himself Venezuela’s legitimate president during a day of nationwide protests that challenged and infuriated Mr. Maduro and his loyalists. Mr. Maduro called his adversary an American puppet, broke relations with the United States, gave its diplomats 72 hours to leave and ordered Venezuelan diplomats in the United States to return home by this weekend. The Trump administration and several other countries in the region quickly recognized Mr. Guaidó as Venezuela’s legitimate leader, depicting him as a democratic savior trying to rescue the once-prosperous country. They say Mr. Maduro was elected fraudulently and should resign. But Mr. Maduro received an important reassurance on Thursday, when the country’s defense minister pledged the armed forces would remain loyal to him. At the same time, Russia, an ally of Mr. Maduro that has provided his government billions of dollars in aid, warned the United States not to meddle in its affairs, effectively placing Venezuela in the middle of a new contest of wills between the Kremlin and Washington. Mr. Guaidó had largely stayed out of public view after his self-declaration as president, amid speculation that Mr. Maduro’s security forces could take him into custody. Ms. Valera, who attended the rally at the Simón Bolivar Plaza in eastern Caracas, the capital, said opposition politicians were continuing to hold discreet talks with military leaders and remained hopeful that they would soon build enough support to get large factions to switch sides. She said that even if Mr. Guaidó was arrested, that would not stop their plans.“We think we are on the right path,” she said. Damelys González, 75, was among those who turned up at the plaza, holding a Venezuelan flag in one hand and a cane in the other, to rally behind Mr. Guaidó. Despite Mr. Guaidó’s call for peaceful demonstrations, violent and sometimes deadly protests have flared repeatedly over the past week. On Friday the United Nations human rights office in Geneva reported that Venezuelan security forces and pro-government armed groups had killed at least 20 people and wounded many more in recent days. Local groups reported a higher death toll. The United Nations human rights chief, Michelle Bachelet, condemned the killings by forces loyal to Mr. Maduro, who has faced growing pressure over his stewardship of an oil-rich nation that has plunged into a prolonged crisis. During an interview on a radio show Friday morning, Mr. Guaidó urged Venezuelan diplomats in the United States to refuse Mr. Maduro’s orders and keep working. Mr. Guaidó said aides he described as his transition team had been busy over the past couple of days, developing plans to bring humanitarian aid to Venezuela and to start mending the economy. But, speaking from an undisclosed location, he acknowledged the precariousness of his situation. Although the Trump administration had said it would ignore Mr. Maduro’s deadline for American diplomats to leave, it acknowledged on Thursday that a number of diplomatic personnel and their families would be evacuated. Reuters reported that a convoy of vehicles carrying American embassy personnel was seen early Friday heading for the Caracas airport. Secretary of State Mike Pompeo, who has implored all nations to recognize Mr. Guaidó as the legitimate leader of Venezuela, was planning to press his case on Saturday at a meeting of the United Nations Security Council in New York. But Russia, which like the United States has veto power on the 15-member council, was widely expected to block any move that would recognize Mr. Guaidó’s legitimacy.